Grantland’s Bill Simmons has often written about the “no f—ing way game” that “usually happens in franchise mode when you’re 5–0 or 6­–0, then a chip activates inside the game and kicks it into ‘There’s No F—ing Way You’re Winning This Game’ mode.” At that point, every good play you make will be called back due to penalty, your 99-rated quarterback will inexplicably be unable to hit receivers, your defense will suddenly forget how to tackle, and the game simply refuses to let you win, no matter what buttons you push or levers you pull. The point of all this is that I think the 2012 Florida State team had its “no f—ing way” game on Saturday night, starting with the sudden illness of starting RT Menelik Watson, who has been a big part of the FSU offensive line’s resurgence this year. FSU then managed to go into NCSU, charge out to a not-as-big-as-it-should-have-been lead, go into the fourth quarter leading 13, and somehow give up one of the worst choke-job losses I’ve seen in a while. Absolutely nothing went right in the fourth quarter, from poor coaching decisions (why not kick a 52-yard field goal to go up two scores again?) to repeated missed assignments from one player after another, to an inexplicable repetition of last week’s blocked punt (that still went just far enough to ensure that by the time NCSU scored, there’d be no time left for FSU to have a legitimate chance to make a final scoring drive), to uncalled holds on the last two NCSU drives so bad that the NFL scouts sitting near me were shaking their heads in disbelief, to a questionable catch giving NCSU a crucial fourth-down conversion, to quarterback Sean Glennon playing the half of his life, suddenly finding the ability to evade the pass rush and fit throws into two-foot windows. The whole collapse seemed scripted, like a bad Hollywood movie or the “no f—ing way game” where the console has predetermined the end even if it gives you hope until the fourth quarter. And yet, Florida State absolutely should have won this game anyway, with poor preparation and some head-scratching decisions from the Seminole coaching staff ultimately to blame. An oft-repeated (and retweeted) stat after the game notes that this is head coach Jimbo Fisher’s fifth loss against a double-digit underdog since taking over at Florida State, a remarkable number especially considering his record in games where FSU is favored by less or even an underdog. Somehow, Fisher and his staff have seemed unable to get his players to execute at a high level against teams they should beat but are still good enough to beat them. And yes, that is what this loss—and paltry 16-point output from the offense—boils down to. No, playcalling was not the problem, though Fisher could have certainly called a better game. Playcalling is the constant culprit among fans and most media when an offense bogs down, but the reality is that the impact of playcalling is really overrated. High-level football is not like Playstation or Xbox (the comparison above notwithstanding) where if a play doesn’t work it’s probably due to it having been a bad call. No, the thing that separates teams is how well they execute. That’s why Dana Holgorsen’s West Virginia offenses have been so statistically dominant—not because of some playcalling genius but because Holgorsen has been able to get his offenses to execute at an insanely high level. (Having Geno Smith throwing at an over 80% clip while still throwing downfield certainly doesn’t hurt things—if Smith completes 50% of his passes, that offense doesn’t look so good.) The truth is, Holgorsen doesn’t even call a large number of his plays. Rather, his quarterback calls the play at the line of scrimmage, a good example of how little value Holgorsen places on playcalling. This is where Florida State really needs to take the next step forward: the execution problems witnessed in the second half against NC State evidenced a team that was quite simply not in synch, an offense that was somehow inadequately prepared to close out a team it had on the ropes. The calls—though certainly not beyond improvement—were there, but the execution was poor, from missed blocks to missed wide-open receivers. The Seminoles were certainly not helped by the fact that NC State definitely played their best game of the year, playing sound defense with none of the major breakdowns they had shown against Tennessee and Miami. Florida State was not the beneficiary of numerous turnovers and defensive miscues and needed to go out and win this one outright. Unlike a week before, NC State had no interest in giving this one away. One call that is worth questioning, however, is the third-and-two in field goal range in the early fourth quarter. A field goal in this situation puts the Seminoles up three scores, effectively putting the game away, making basic handoff to the tailback or quick pass relatively safe and straightforward options. Fisher, however, decided to get aggressive and go for a first down, calling a blocked naked bootleg—a designed quarterback run off play action to the tailback. As it turns out, NC State did exactly what FSU expected, bringing both end men from a six-man front (this, by the way, is very similar to FSU’s base short yardage scheme under Mickey Andrews). FSU had already set this play up with an inside run to James Wilder, Jr. earlier in the game, which NC State attacked and stuffed. This play attempts to counter that aggressiveness with an outside quarterback run, a naked bootleg with both tight ends and both backs staying in to block, with only the outside receiver (bottom of the screen) running off the coverage. There is no real pass option here unless the defense chooses not to cover the single receiver (highly unlikely), but if the quarterback is in trouble, he can throw the football out of bounds. 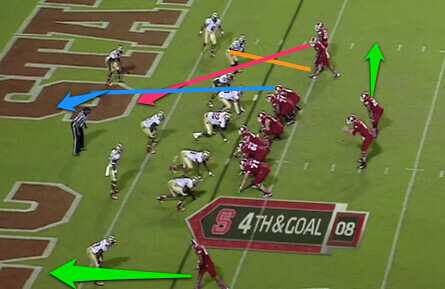 NC State indeed flows to the football, with the linebackers and safety taking steps toward the play action. 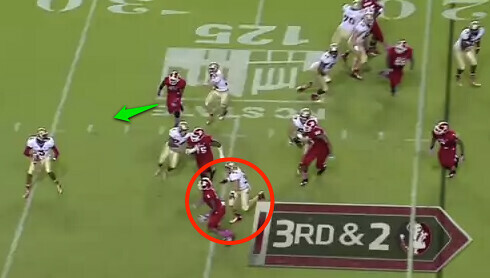 Tight end Nick O’Leary has already lost his battle at the top of the screen (green arrow), while the key matchup is Kevin Haplea’s block at the bottom of the screen (circled). Haplea needs to seal the edge here without letting his man get inside too quickly. Unfortunately, the end man plays with more discipline here than anticipated, already working to get his outside arm free. I suspect the Wolfpack coaching staff emphasized staying disciplined and keeping contain during the timeout and that this call would likely have worked much better had it not followed a timeout. When Manuel turns to finish the play fake, he’s a little deeper in the backfield than ideal, but if Haplea has sealed the edge, this is an easy first down for Manuel. 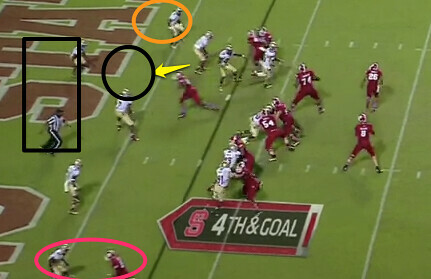 Instead, Haplea (red circle) has lost his leverage and the NC State player has kept contain. To make matters worse, O’Leary (green circle) has basically whiffed on the back side, letting his rusher pursue the play at nearly full speed. Manuel recognizes that the contain man has kept his leverage and begins to pull up. This is where he should just throw it out of bounds. 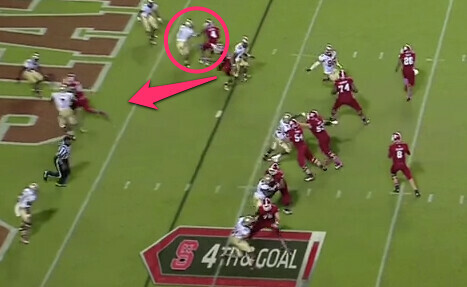 Alternately, he could have kept running towards the sideline and dived forward to minimize the loss here. A fifth-year senior quarterback simply has to play smart situational football in field goal range and the coaching staff has to have him ready to minimize the loss if the play isn’t there. Unfortunately, from here, Manuel spins back right into the pursuit, leading to a huge loss. Fisher then compounded the loss by electing to punt rather than give kicker Dustin Hopkins a chance to salt the game away with a 52-yard field goal—probably the decision he most regrets from this game. All in all, this play call is not a bad one schematically, though it was probably negatively affected by coming immediately after a timeout. I did, however, have more problems with the way the defense was called in the second half, as the front four began to tire and struggled to get consistent pressure against Glennon (a good example of why Seminole fans should be frustrated that the defensive coaching staff has refused to use their superior depth and play some of the younger players early to keep its starters fresh later in games). Coordinator Mark Stoops typically kept his two safeties back, content to prevent big plays and force NC State to execute perfectly to drive the field. Unfortunately for Florida State, the Seminole defense had trouble getting itself off the field in the second half, starting with the first drive of the second half, a 15-play drive that took over six minutes. This inability to get itself off the field in crucial situations is reminiscent of all four losses last year, where the same problem reared its ugly head. I remain convinced that the biggest reason for this difficulty is Stoops’ unwillingness to bring extra pressure on third (and fourth) and long, forcing quick throws into tight coverage. Instead, if the front four can’t get pressure, teams with good quarterback play will convert more often than not. The ‘Noles are also 78th in the country in forced turnovers after finishing 41st last year. As good as their defensive line has been, they simply need to manufacture more pressure on the quarterback to produce more turnovers, giving the offense better opportunities and getting themselves off the field more often. The final play of the game serves up another example of Stoops’ coverage philosophy, as Stoops again rushed four (really three, since Werner seems to be a “spy” while initially providing extra flat coverage/contain on the play). The coverage is a hybrid man-under with the two safeties serving as “robbers” in the middle of the field (since there are no deep zones), floating to wherever they recognize a threat. NC State dials up a pick play, with the inside receiver running at nickelback Tyler Hunter (orange line) to create space for a “look in” route from the outside receiver (red line). Hunter and cornerback Nick Waisome should switch men here as the outside receiver goes inside. The tight end (blue line) runs straight upfield to clear out the weakside linebacker (Christian Jones), while the back runs a flat route to clear out strongside linebacker Telvin Smith. 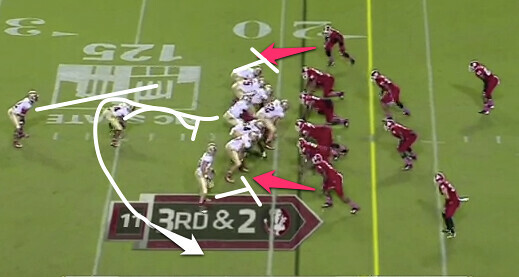 Below, you’ll see how the defense is designed. Hunter should have whichever receiver comes inside in man-to-man and is initially responsible for the black circle off the line of scrimmage. Joyner has the boxed area, and Waisome (orange circle) will take whichever receiver goes outside. In the next frame, you see how the receiver gets so open, as Hunter goes along with the inside receiver (working as a pick play) and Jones with the tight end, with the outside receiver getting a clean release for a wide-open touchdown. Ultimately, Hunter misplayed this, as he should have maintained inside leverage on his receiver and swapped with Waisome on the outside release of his man, but it’s a well-designed and executed play by NC State, which clearly anticipated man-under coverage and enough time to let the receiver clear. Although it’s a mistake in coverage that gave up the TD here, I do think the Seminole defensive staff put the players in a bad place. Were I the coordinator here, I would have much preferred to bring five or six to pressure Glennon into a quicker throw and trust the DBs to cover; in this situation, you just can’t afford letting the quarterback throw with no pressure. It’s a loss that never should have happened, but it is one that this site (unfortunately) saw coming, as we picked Wolfpack to be the one team to beat the ‘Noles in the regular season. I’m sticking with that prediction, as I expect this team to recover and win out in the regular season, despite a strong test from a very good Florida team in November.